What is in your glove compartment? For most of us, our glove compartments are stuffed to the gills with old receipts, expired insurance and registration as well as a few odds and ends. But what happens when you actually need to locate your CURRENT registration and insurance in that mess? 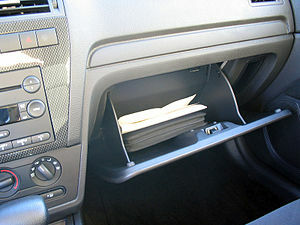 Let's go over some important things to keep in your glove compartment in tip top shape! What should you keep in your glove compartment? Keep it clean: empty it out and wipe it down often. Throw out expired materials and irrelevant papers. Make it functional: keep a nylon bag for your emergency accessories and a small folder for your insurance, registration, and roadside assistance.